I haven’t been analyzing public for more then a year as I decided to quit writting about my view, but the EUR/USD seems so interesting that I just have to write something about it and hear your oppinion. If you participate in the currency market, you know that most of the analysts predicted the possible parity during the EUR/USD 2014/2015 fall, but not before the pair reached 1.0600/500. Also, if you have followed my analysis at that time, you all know that I have found the bottom of that fall exactly at the 1.0500 level on March 11. 2015 in my blog. But now, when noone see this possibility, I maybe see it technically and fundamentally. 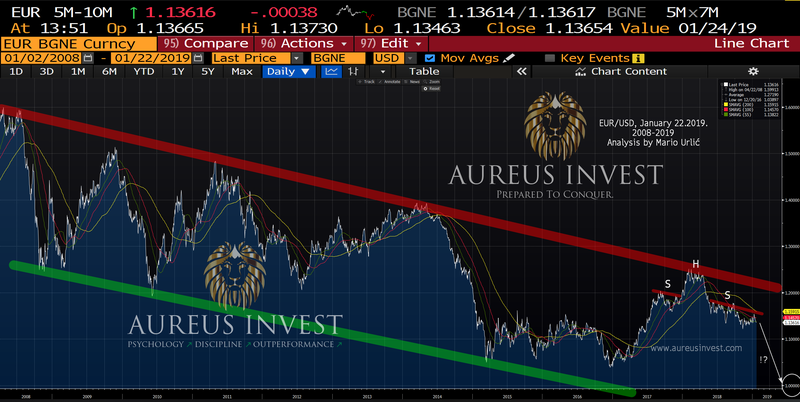 My followers probably remember my prediction of a possible 1.2500 EUR/USD target during on August 02. here in my web, when the EUR/USD broke 1.1500, after which my prediction happend couple of months latter, exactly on the predicted target. On both of my analysis, from 2015 and 2017 you can see the exact down trendline channel as in this analysis today. It still works and now I see the H&S pattern pointed in my chart, which could possibly lead the EUR/USD toward 1.0500 again. If that level will be reached, then the 1.00 level will be reached as well in my point of view. I mean, technically the picture is more then clear as you can see it here. From the fundamental side, take a look at the main part, changes in Interest rates by FED and the ECB from 2014 until 2019. The FED tightens it’s monetary policy for 3 years and intends to continue it in 2019, while the ECB at the same time keep the same at the lowest point as it has not reached it’s inflation target of 2.00 percent and it will not in 2019 for sure. Currently the EMU inflation is at 1.6 percent. Considering theese fact and technical analysis, there is a possibility of US dollar furder strengthening versus the Euro in 2019 and the 1.00 level could be seen as the sellers target. What’s your view on this potential solution and my analysis? Pozdrav maistore, kao dugogodisnji fan za EUR-USD i da je pitanje upuceno prije nego što je godina odgovor DA bi bio kao kuca! Danas, mada tehn. i fond. analiza stoje tu nema dvojbe ai sve što si naveo gore o FED-u i OCB je vidljivo tocno! I treća stvar polozaji i razmisli kod vecine trejdera su KUPITI na tom paru što je dobro jer ako krene lavina bit ce SL lov za izvoz.Muci me brexit i to ce utjecati na EUR a jos nista, nakon toga poraza od 200 glasova funta je trebala slabiti .Mislim da će do kraja ipak oslabiti na 0,93 do 0,95 EUR-GBP. Iako ne bude teško. Dakle, moje razmišljanje za prvih 6. mj 2019 je da EUR-USD padati do razina 1.10 – 1.08 u nekim eksstra razmjestajima bih rekao da možda zatvori onaj jaz na 1.07 samo pod uvjetom da se ne popne preko 1.18, ali da je sve, nikad tako daleko nisam isao 1.00 ni ne vidim takav cilj! Medjutim ja sam nevazan ako su odlucili ili odlucuju veliki da ce se i dogoditi! Moze se i vi dodavati problemi u Franc. Italiji.Njemacka izbori ovaj Brexi, Kina moguca recesija USD! Zakljucak dok je god vecina trejdera (ne banke) u pozicijama vise pozicionirana na duge (duge) polozaje vise je sanse da se to dogodi (PARITET) moj san u 2017. Negativne reakcije; Trump tvita, ne zeli jak USD, FED okrene ciklus, prošla dionica, zlato ve se spekulira ako nastane recesija moguci blizu prijasnjih visina 1900! Vidit ce mo, forex je nepredvidljiv!